-DNR Conservation Officers wrote over 3,700 ATV violations and warnings. From Jan 1 to Dec 8, COs wrote 911 citations, and 2790 warnings. There are 25 violation categories. Of the ATV tickets, the top 3 are “License/Registration/Permit Not inPossession or Displayed” (286), “No Valid License/Registration/Permit” (167), “Youth Operate w/o Helmet” (117). Most of the violations are $125 or more (including surcharges). By comparison, COs wrote 339 tickets to snowmobilers, 80 to dirt bike riders and 16 to 4WD truck drivers. If you’d like to receive the complete list, reply to this email and we’ll send you the DNR table. the Grant County ATV Park and the RTP 25th Anniversary in the December NOHVCC newsletter, at this link: http://nohvcc.org/Materials/Newsletter/December-2016. The Pilot newspaper just published its 115-page resource guide for Central Cass and Eastern Hubbard Counties. It was delivered with the Pilot paper last week. A full-page article with photos on the Woodtick Wheelers is on page 104. Watch for it! Trail Ambassador programs featured in magazine. Minnesota is one of only 4 states with a Trail Ambassador program. The American Motorcyclist Association (AMA) wrote an article on them a while back, and recently sent us a pdf of it. You can read it in the attachment to this email. -Saturday January 7, 2017 @ 10:00 a.m.
-Saturday March 4, 2017@ 10:00 a.m. Thanks for supporting the club! 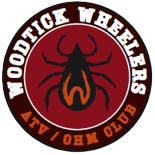 ‘Like’ us on Facebook and visit WoodtickWheelers.com. Send us your ideas, places you’d like to ride next year, and other comments!